We are delighted to announce the Top Finalists from the 2019 Most Valuable Student scholarship class! 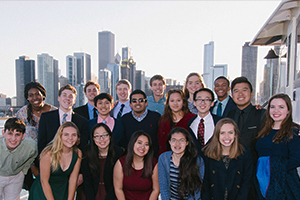 These finalists will join us for the sixth annual MVS Leadership Weekend on April 11-14, 2019, in Chicago. Over the course of the weekend, the finalists will enjoy breakfast with the Elks National Foundation’s Board of Directors, participate in workshops for leadership development, serve with our nation’s veterans, sail away during a dinner cruise on the Chicago River, and engage in interviews to determine who the top winners will be in this year’s MVS contest. Each student attending the Leadership Weekend will receive a scholarship of at least $20,000 to support their college dreams. Following interviews with the national judges, two scholars will walk away with third place awards of $30,000, two will get $40,000 in funds to support their education, and the top two winners will receive $50,000 each. Congratulations to the Top Finalists!